The Korg Sound on Sound is likely to become a must-have utility item for many musicians. Unlimited overdubs. Dedicated guitar input. Onboard rhythms. No USB connection. Complex to use. 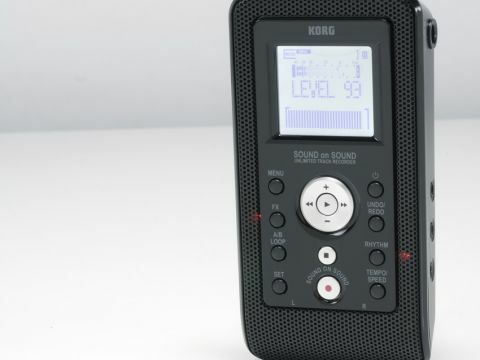 While the Korg Sound on Sound Unlimited Track Recorder (SOS) can record stereo audio in any location like the rest of the handhelds on the market, it supports overdubs - as many overdubs as you like, in fact - the amount only limited by its memory capacity. With a wedge shape that makes it convenient for placing on a tabletop, the SOS can record through its internal mics but can also take external mic or line signals or the output from a guitar. Guitarists can, in fact, benefit from an onboard tuner and a range of amp sims (just some of a wide range of onboard effects) to transform their sound. The SOS even comes equipped with 50 onboard rhythms and facilities to loop audio and slow it down without changing pitch, so can be put to use as a practice aid and phrase-trainer. In fact, it's hard to think of a useful musical feature that they haven't squeezed inside! Perhaps best of all each overdub is recorded as a separate WAV file and the whole lot can be transferred to a DAW as separate tracks - all automatically lined up with the correct start and end points, if the DAW supports the BWF format. It's rather complex to use (and baffling if you were expecting a straight up 'recorder') and there's no USB (so you'll need to use a card reader to transfer audio) but these are small flaws in an amazing bit of kit.